For far too long Microsoft Azure has been sold as something it’s not – an instant magic wand for all your IT requirements. 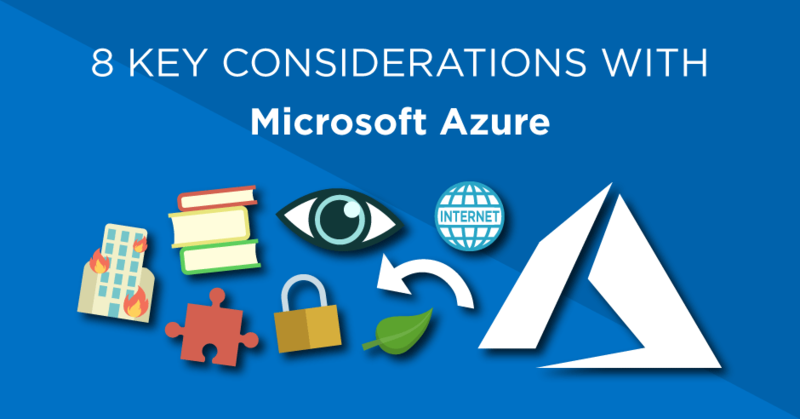 Simply put, Azure is a tool for delivering an IT project and, as with any project, it’s important to choose the right tool for the job. The magic wand status of Azure has come from the fact that there are few IT infrastructure migrations where Microsoft Azure is not that tool. The reason Microsoft Azure is used so often is (continuing the tool analogy) many cloud platforms are the equivalent of a hammer – very good at one thing, but perhaps less useful in other scenarios. Azure, on the other hand, is a Swiss army knife – highly capable and highly versatile in a range of situations. In any migration, be it to a public or private cloud, bandwidth can easily be overlooked. It’s a factor which needs to be under continual evaluation – since missing something here easily swallows up savings. It’s also important to be considering latency. Far to often, businesses move a service into the cloud which originally ran on a local LAN and realise too late their WAN can no longer support the additional load. The best case scenario for if this happens is the newly migrated application runs slowly. The worst case is the entire network grinds to a halt. Even with all the experience in the world, unforeseen issues can arise during a project. Something goes wrong or is delayed and suddenly you needed that service yesterday. Rollbacks are sometimes necessary to keep operations running smoothly, so knowing how you’re going to get back to your previous position is vital. You should never be in a situation where there is no way back, nor should you attempt a ‘big bang’ migration. The risk you expose yourself to is simply not necessary. On the surface, public cloud services (such as Azure) look cheap. However, when you start moving noisy programs and bandwidth-heavy systems, a different picture of how much you’re spending emerges. Modelling your true costs prior to the migration is imperative to prevent your project from going grossly over budget. Don’t assume you will simply be paying for space and compute like you typically do with a cloud provider. It’s likely that reads and writes of data, as well as the costs of transporting it around, will be included as well. This can quickly lead to you chasing bottle-necks, often in areas such as disk storage speeds and IOPS and therefore losing out on performance. A good place to start when sizing up your project is the Azure Migrate tool. The Microsoft Assessment and Planning tool is also valuable at this stage. One of the well-known phrases trotted out by service providers and software vendors when discussing if their application will continue to function if you move it to the cloud is: “well, it should work.” Many software vendors are still only in the exploratory stages of rigorously testing how their applications run in a public cloud environment, so take that “should” with a large grain of salt. You should always be getting guarantees on performance and support prior to signing any migration and service contract. Too many service providers will simply sell a solution without proven experience. If in doubt build a test platform and test it to destruction. Whatever you’re hosting, you need to have the right monitoring, management and reporting in place to ensure there are no surprises during your journey to, and the time following your migration. Before you enter the cloud, you need to know what service levels you require and what your capacity management structure is. You also need to consider where all your alerts and logs will go and how you’ll manage them and act when required. Fortunately, there are numerous products to deal with these issues. Just be sure you start with the end in mind, instead of dealing with issues as you encounter them. Yes, Microsoft has a huge cloud infrastructure and yes, your data is replicated all around the place. But this doesn’t mean you won’t have an outage. There are so many variables involved in cloud infrastructure that, chances are, you will at some point experience an outage. If you’re moving into Azure then know what your DR and business continuity plans and solutions are. Then once you know them, test them to ensure they’ll actually work when they’re needed. Azure is a completely different ball game to managing a traditional private cloud platform or on-premise solution. It’s therefore important you either partner with a trusted consultancy and service provider and/or you skill up your internal team with training. There’s a wealth of training solutions out there, and Microsoft’s own certifications are an excellent place to begin. Covering a wide and granular range of areas, allowing you to tailor your skill-set to exactly the right level. You can’t talk about anything related to IT without mentioning security, so this point was inevitable. The summary is that you shouldn’t treat your cloud platform any differently to your internal security. You certainly shouldn’t believe you can offload the risk to Microsoft. Securing your cloud is a vast enough topic that it would be unjust to try and cover it under this one heading, but one key area often overlooked is watching the network – both for internal and external traffic. At a minimum, you should really be using Deep Packet Inspection and UTM firewall appliances, of which there are numerous in the Azure marketplace. As with any platform migration, it’s all about the planning. The more you plan and prepare the smoother your migration will be and the lesser your costs. If you’re looking for a highly experienced consulting firm to ensure your migration to Azure is successful, get in contact with us and one of our senior Azure consultants will be able to help you with your move into the cloud.